Starport One hung in the light-scarce black of the heavens with all the brightness, form and color of some rare flower. Inside the glittering bubble of synthetic atmospheric shielding, platforms unfolded like leaves and petals, bearing ships and shops and people, and the trunk from which the platforms seemed to grow was shining with city lights. From the outside, it was graced with silent majesty, a jewel of mankind in the midst of empty space. Inside, the serene beauty gave way to noise and activity. People running with clattering feet, orders and questions called out in twenty different languages, the continual hiss and clank of pneumatics, and the occasional eerie scream as a ship entered the synthosphere. There was barely a speck of boredom to be found on the whole scene. The speck of boredom had a name. Brevian Ecklesworth III, prince of the Fourth Quadrant, was sitting on a pile of sacks and picking absently at his shoes. After a few seconds, he looked up, flopped back on the sacks–plain things, marked in strings of Xanthurian symbols and smelling of stale dust–and sighed. “Why are we here?” he asked, directing the question at a figure, not much taller than himself, who was scowling at the glowing screen of a notepad. Their parents, with great originality, had named him Brevian Ecklesworth II. Brevian II peered at his younger brother, corrective holo-lenses lending a faint glow to his face. Due to the plain clothes that he wore and the look of pinched thoughtfulness on his face, he might have been mistaken for just another merchant’s clerk or ship’s boy making inventory. Only the thin plutonium circlet set crookedly on his head marked him as royalty; the distant, but very present, circle of imperial guards served to solidify his identity as Brevian II, son of Brevian Ecklesworth I, heir to the throne of the Fourth Quadrant of the Imperial Galaxy. Brevian the younger had a plutonium circlet of his own, but he’d lost it somewhere. “Because if I’m going to be writing a report about industry in the capital quadrant, I need to see some examples of industry in the capital quadrant.” Brevian the elder said, with condescending patience, as he made another note on his pad. “That,” the elder Brevian replied, kneeling to copy out a few of the Xanthurian symbols, “is tourism. We are not tourists.” He continued copying out the symbols, writing a running translation underneath them. Brev watched, feeling more than a little envious. Xanthurian was a sharp, slicing language, and he’d wanted with all his heart to learn it, but his tutor-droid had refused to teach him, saying that Xanthurian was far too complicated for his ‘junior intellect’, and insisted that he learn the easier language of Parve first. Parve was basically the Imperial Tongue, but with more loops around the vowels, and sometimes it went backwards. Frustrating and boring all at once. Brev sighed again. The nurse-droids and tutor-droids tried–they really did–but their company was always a little stale and unsatisfying. He’d come along today in hopes that his brother’s company would be an improvement. Fortunately, he was used to dealing with disappointment. With another pointed sigh, he laid back against the sacks, tried to enjoy the unusual experience of being let out of the palace, and stared up appreciatively at the vast expanse of Starport One. Above Platform 34, where they sat, the glittering surface of the synthosphere vaulted wildly, filled with airlocks that constantly zithered open and closed to accommodate the constantly moving ships, screeching as the atmosphere rushed to regulate itself. 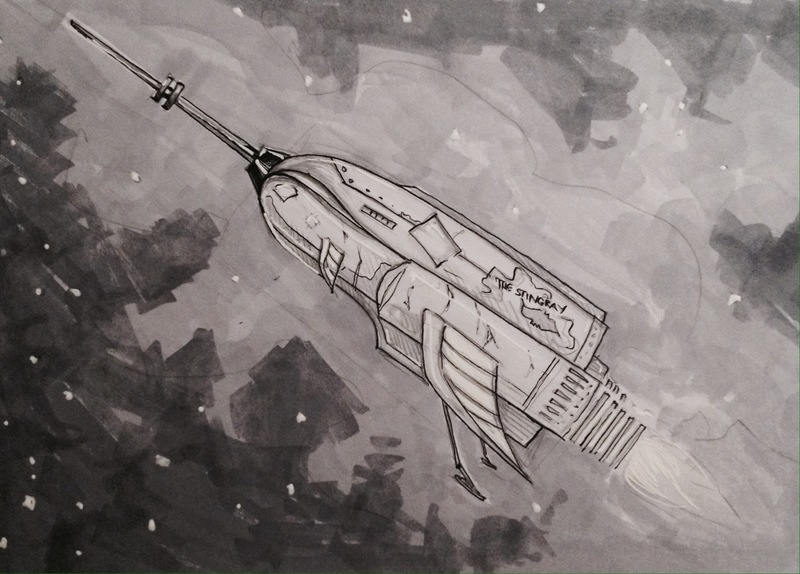 Ships in need of repairs hung midair in gravity bubbles, silver-jumpsuited mechanics drilling and hacking at them, showering golden sparks. The sparks were dull, yellow, glinting things, compared with the stars that glittered out in the black beyond. Brev focused on them, first on the sparks and how yellow they were, then on the stars and how blue they were. He liked the look of the sparks. The crown prince’s voice broke in on his thoughts, and Brev looked up, blinking, to find his brother looking at him with sour amusement. “I’m not sulking,” Brev snapped, sounding extremely sulky even though he spoke the truth, and Brevian the elder snorted. Brev scowled. He’d been occupying himself just fine. And besides, there was a difference in being entertained and being included. He was about to point this out when the crown prince shoved lightly at his shoulder. Brev stumbled, displaced from his seat, and turned to find the crown prince absorbed in his studies. A spark of indignation rose in his chest. The crown prince wanted him to entertain himself? He looked around their platform, busy and bustling thing that it was, and at the ring of Imperial guards with their backs to them–looking for threats to the princes, not at the princes themselves. Beyond that ring, a small ship caught his eye–a rusted thing, less imposing and more interesting than any of the others that the platform sported. It was a streamlined affair, patched in places with discolored secondhand metals, and had a painting of a blue fish on its hull. Underneath the painting, scrawling Parve letters read ‘The Stingray’. The cargo bay was standing open and empty. 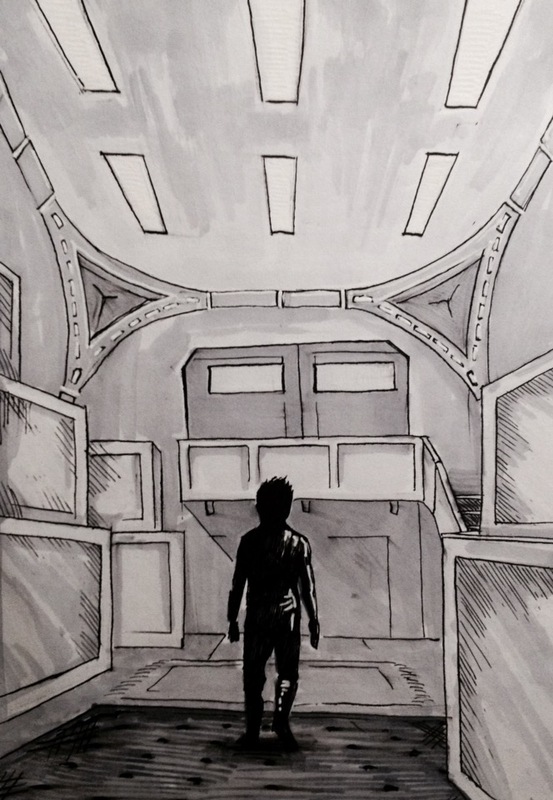 Brev glanced back once before he reached the ship, but no one seemed to have noticed him leave. The guards were still standing to attention, Brevian the elder still scribbling Xanthurian translations on his notepad. Brev huffed a breath, and stepped into the ship’s empty hold. It smelled…strange. Sharp. Uncleaned and adventurous. Black rubber treaded the ramp up to the hold, and it felt oddly bumpy through the soles of Brev’s shoes. There was another scream as something entered the synthosphere, eerily muffled by the ship’s walls. Brev jumped, heart pounding. The inside of the strange ship suddenly seemed a bit too unfamiliar and a bit too large. He faltered and turned around, ready to go back. But when he turned he saw that everything was just as he left it. Brevian the elder still looking intently at his notepad. The guards, still guarding. No one had noticed he was gone. He stopped, feeling something unpleasant coiling in his stomach–something that whispered for him to stay here, and hide, until someone did notice he was gone. Maybe until they were well and truly scared that he was. He backed slowly up into the ship, glancing around for somewhere to hide–found a small, cool space between one of the crates and the wall, and settled down into it, feeling his resolve deepen. It deepened every moment that there failed to be a frightened shout of ‘where’s the prince?’. It dug itself deeper than a dead man in a graveyard, deeper than the mysteries of a black hole, and left Brevian tired, frustrated, and annoyed. The cold metal of the ship’s floor was making him sore, and he laid down. All the wearing bits of the day settled deep into his bones, and his eyes closed. Before he knew it, he was asleep. He woke to a clatter of cutlery, and blinked. Thick sleep-spit covered his tongue, a cold shiver ran down his spine, and there was a vaguely sore imprint of his own sleeve on his cheek. He blinked, wondering how long he’d slept. Had they still not noticed he was gone? Along with the clattering cutlery, the smell of food was wafting over the crates, making Brevian’s stomach grumble. There were voices, too, he realized. Unfamiliar ones, jabbering in Parve. On the other side of the crates, a few people were starting to chuckle at the story. Brevian, on the other hand, felt his muscles slowly beginning to seize up in a panic. He’d stayed too long. Who were these people? Brevian blinked. He had to get past the crates, past the people, and back onto the platform of Starport One. The only plan his scrambling mind could come up with was to bolt for it. As it turned out, this was not a good plan. There was a shout of surprise at his appearance, which surprised him in turn. The room looked odd, somehow; wrong. More occupied, for one thing. People were gathered around a table in the middle of the room, their white-rimmed stares of surprise barely a blur in Brevian’s vision as he rushed to dodge them. He was almost past when a thick, tattooed arm shot out, blocking his path. He struggled against its grip on him, vaguely aware of the screech of chairs being pushed back. 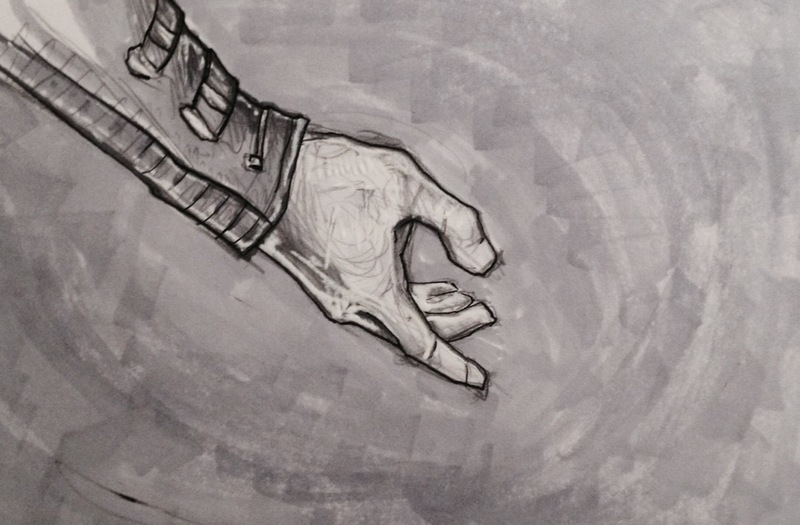 Another hand was laid on his shoulder, and his struggles became utterly useless. Abruptly, he realized what was wrong with the room. The door to the cargo bay was closed. Brevian stopped struggling and stared at the thick metal. He wasn’t going to be able to get through it, and if he screamed, no one outside would hear him, imperial guards or otherwise. “Let me go,” Brevian said again, attempting to sound commanding. He failed. “Let me out.” On out, his voice cracked with emotion, and he fell silent. And then he looked away from the door, to the faces of the people half-standing around the table. Faces worn like leather and pocked with scars, all regarding him with varying levels of interest. No imperial guards in sight. They were three light-jumps and half a galaxy away from Starport One. It was the grey-haired woman who had told him that, and she was speaking now. “We could…take him back?” she suggested tentatively, the deep crow’s-feet around her eyes and the wisps of hair that had escaped her braid contrasting sharply with the hand that was resting easily on the machete in her belt. Brev was staring at the sword and feeling increasingly uncomfortable. The crew had surrounded him, a circle of dirty, unfamiliar bodies, all talking over his head about what to do with him. The only face on level with his own was a dwarf’s, but Brev was too preoccupied with the weapons-heavy belts that every other member of the crew wore to look at him. “And waste all that fuel going right back to where we started? I don’t think so.” the other woman, young and blonde with a black tattoo snaking up her neck until it clipped her jaw, said. Brevian looked up at him briefly, saw that he sported a beard and a blue ponytail, and looked back down at his feet. “Since when did Breaker care about morals? I thought he used to kill people,” Liz snapped. “I’ve always cared about morals. I didn’t always understand how they worked,” the one called Breaker said patiently, and Liz huffed. “No one’s getting thrown out the airlock.” the dwarf clarified, and Brevian shot him a grateful look. To everyone’s credit, they had tried to talk to Brevian before they’d started talking about him. But the answers to the questions they’d asked had stuck in his throat. Oh, I’m the second prince of the galaxy, and I hid on your ship because I was bored. It sounded ridiculous. It sounded, actually, a bit like a lie. And even if Brevian didn’t care about sounding ridiculous or being accused of a lie, there was also the very real possibility of being taken seriously. Even unimportant second princes could be kidnapped for ransom or sale to rival monarchies. He’d decided to stay prudently quiet, and slowly, they’d stopped asking him questions and started bickering over him like her was the last packet of Protein 4. “Captain?” the dwarf asked, turning to the man with the eye patch and the laser pistol. So far, he’d stayed fairly silent. “Not to worry, Breaker. The Captain is making ill-advised jokes,” the dwarf said, raising his eyes in a plea to the heavens–or, rather, the ceiling. “Ah, you’ve got me, Boreus,” the captain said with a grin. He took another look at Brevian, then squatted down so that his head, if not even with Brevian’s, was at least no longer towering over him. He had a sharp-edged face, Brevian thought, but not an angry one. Brevian hesitated, and a small smile flickered over the captain’s face. Brevian wasn’t listening to her. He was thinking. Not about kidnapping, but about returning home, back to the bland nursery rooms no one seemed to have noticed he’d outgrown, to the company of well-intentioned nurse-droids with their painted-on smiles, the guards who never spoke, and the scornful presence of the crown prince. He did not want to go back. The sudden pity on the captain’s face almost made him guilty enough to tell the truth. “I … don’t have a house either. And I take care of myself, thanks.” He wondered for a moment if he should try to mimic the strange accent and amalgamated pidgin dialect that he’d heard coming from the children who hung around the docks. He decided not to try. “There’s no need to be rude,” Breaker rumbled. The captain wasn’t listening. He stood again, and held out a hand to Brevian. The Stingray sped through the light-scarce black of the heavens with all the speed and grace of a tigress on the hunt. A slightly rusty tigress, but a tigress nonetheless. The copper and zinc of her hull was battered and scarred, but still shone with pride; discolored patches of repairing metal marked her greatest battles, and the blue paint on her fins had recently been refreshed. From the outside, she was graced with a sharp kind of beauty, the glory of the fighter in apathetic space. Inside, Breaker was washing dishes, and Brevian Ecklesworth the III was scrubbing the floor, uncaring both of apathetic space or the unconscious loveliness of the ship. In fact, what was mostly impressing Brevian was the dirtiness of the ship. The water in his bucket was already black, and he still had half the floor to go. “Have you ever heard the story of our stay on White 16?” Breaker rumbled, suddenly, looking over his shoulder, and Brevian glanced up. A smile flicked at the edges of Brevian’s mouth as he went back to scrubbing. Breaker liked to talk, and had a habit of telling stories–stories of adventures past, some serious and others simply ridiculous. Liz always rolled her eyes at them, but listened nonetheless. Brevian, for his part, loved them. They made things like scrubbing floors and peeling potatoes go by faster. Breaker was in charge of the kitchens, and the captain had made Brev his apprentice. That had been four years ago. It had taken two months for the little ship to make its next port, in which time Brevian had learned to play chess (Boreus’s doing), started to learn how to handle throwing knives (Liz’s doing. Boreus and Breaker were horrified, but she’d stopped threatening to toss him out the airlock), and learned to put out a grease fire (which he’d started). Brevian had hid when they’d reached that first port, not wanting to leave, even if everyone was angry at him for having stayed. But once again, no one looked for him. 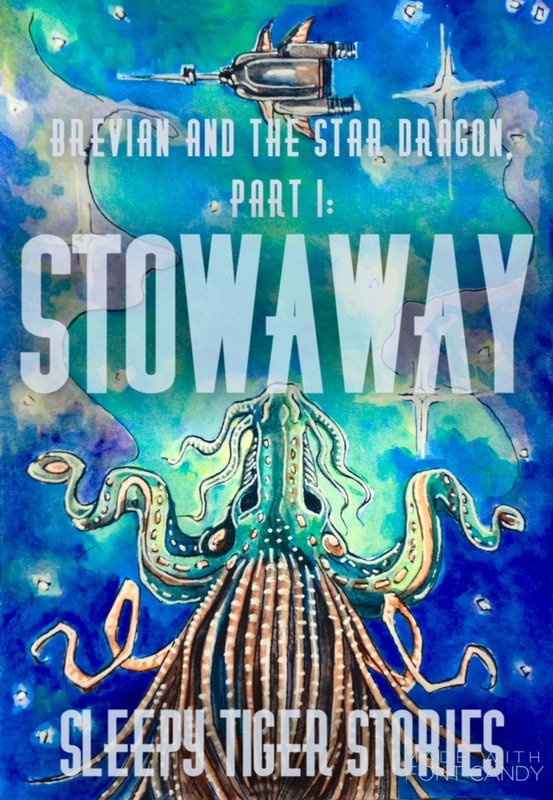 When the ship left port a day later and Brevian had gathered up the courage to step out into the open, no mention was made either of his disappearance or his continued stay. It had felt almost like welcome. Breaker was busy relating how the Captain and Liz had gotten stuck on an ice floe with a herd of wild goats, and Brevian shook the water from his scrub brush with a smile. It was better than welcome, he thought. Better than being tolerated or entertained or honored. Want to be updated on new stories? Please don’t hesitate to subscribe below! I love this! This was so well done. The humor is elegant and the quirky style of writing snagged me right away. I’m so glad I stumbled across the link on Tumblr! Incidentally, I read Beast on Inkitt!! It. Is. AWESOME. Thanks for writing such epicness!! Thank you so much!! I really appreciate you taking the time to read a copy. SWEET. 😃 I’ve only recently heard about Inkitt. Sounds interesting. I’ll have to look into it. I’m planning to launch a new serial on Wattpad soon (that Western/fantasy Beaumont-and-Beasley-spinoff centaur thingy I mentioned on Twitter a while back), and I might possibly try other platforms as well.